I can’t keep this to myself any longer, it’s just too good and you all need to have it in your recipe books. 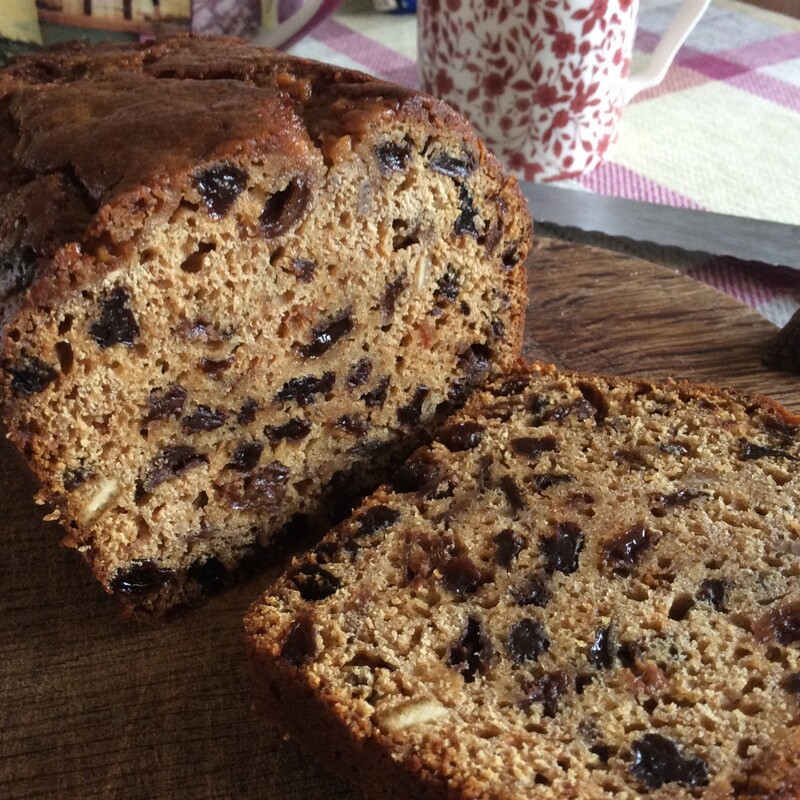 Bara brith, tea loaf, barm brack- whatever your chosen dialect, this moist cake is beyond simple to make and tastes gorgeous. Just make sure you soak the fruit overnight and you’re onto a winner. The different versions are endless but this is the basic loaf – it’s a Mary Berry original recipe and never fails to deliver. A little orange or lemon zest adds a nice twist, especially if using an unusual tea. Combine the dried fruit, sugar and tea in a large bowl. Stir well to mix and then cover and leave to soak overnight or for at least 8 hours. Lightly butter the tin and line the bottom with greaseproof paper. Preheat the oven to 150C (300F, Gas 2). Stir the fruit mix then add the beaten egg and the flour. Mix thoroughly then turn the batter out into the prepared tin. Level the surface. Bake for 1 1/2- 1 3/4 hours until well raised and firm. A skewer should come out clean. Cool in the tin for around 20 mins then turn out onto a wire rack and allow to cool completely. The cake can be eaten immediately but it matures well and I usually allow 24 hours between baking and eating. It keeps for a good week if well wrapped, and it freezes well too. I notice that, whereas all your other quantities are the same as in Mary Berry’s Complete Cookbook, the weight of the dried fruit is not. You have “750g mixed dried fruit (supermarket ‘basics’ work fine)”; on page 471, her book has only “375 g (12 oz)”. I have used her recipe and it works really well; is yours a typo? Thank you, yes it’s is. I don’t know how I came up with that figure! It would be a very fruity loaf indeed!